UPVC Window Handles for Upvc Double Glazing Windows. Which type of window handle do I need?. 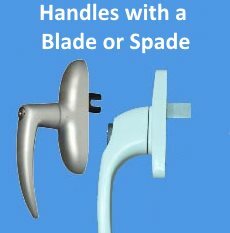 The main two types of window handle are the Espag and Cockspur, after these there are Tilt and Turn handles, Spade or Blade Handles and Fork Handles. An Espag handle is usually fixed by 2 bolts and has a square spindle sticking out of the back. This goes into the window frame and engages with the window locking system (or espag) to move the locking points. The spindle is always 7mm thick but can vary in length from 10mm up to 65mm. 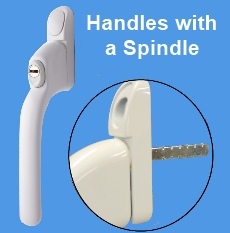 The Cockspur handle is usually fixed by 3 or 4 screws which screw right into the opening part of the window. There is a “nose” that sticks out and this closes over a wedge which sits on the window frame. 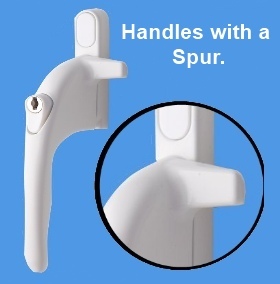 This type of handle is generally found on older upvc windows and on some wooden windows. 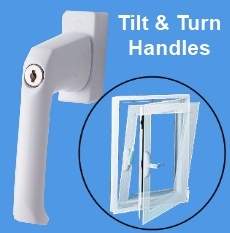 Tilt and Turn handles are similar to an espag handle by having a 7mm spindle on the back but they are usually a bit more chunky to deal with the weight and movement of a Tilt and Turn window (opens inwards). I’ve had new blinds fitted and my handles are poking through, can you help? Yes. 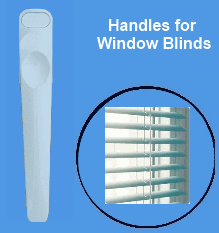 We have slimmer handles which are perfect for behind window blinds, these are available in either espag or cockspur style. I’ve lost the keys to my window handles, can they be replaced? We can replace the majority of window handle keys even if you don’t know which one you need. Simply send us a photo of your handle and we’ll point you in the right direction. Click here for more details. Will I get keys with my handle? All of the locking Window handles from Handles & Hinges come complete with keys and extra window handle keys are available if needed. Most of the new style UPVC window handles are push to open, this means that the handle snaps locked when the window handle is closed, resulting in happy insurance companies and your house is more secure. Do you supply any decorative handles? We stock some lovely monkey tail espag handles in various colours and can also supply tear drop handles by special order.